Do you ever have those days where eating healthy is just not going to happen? Maybe you are super hormonal or you are just feeling lazy or you just have no will power. Well folks I have to admit that was me the other day. And it was all of the previously mentioned downfalls. It first started with a box variety muffins that some how ended up in my pantry. Variety… so of course I had to eat one of each. My only saving grace was the fact that they were ‘mini’ muffins. Then I was given a plate of sugar cookies, that I of course had to taste. Then it was time for lunch. I had all intentions of eating some healthy pork chops and roasted broccoli leftovers but then saw the Tupperware with leftover hot dogs and French fries and my hand made an un controllable beeline straight for them. Then dinner rolled around and Eric called to see what I was making. I told him that I had planned on making chicken and yellow rice but got wrapped up in work instead. I told him I had the leftover previously mentioned pork chops or some cans of soup that I could heat up. He said he wasn’t in the mood for that and showed up 10 minutes later with Taco Hell, I mean Taco Bell. I told myself I couldn’t eat any of it…. that a ‘one point’ can of soup was all I was allowed for dinner because of the day’s previous transgressions. But (I am sure you know where this story is going) ‘Hell’ won and I had some quesadillas and crunchy tacos (and I am admitting… enjoyed every minute of it). But today is a new day! I started my day, not with a variety of muffins but a nice 40 minute run with my dog. Then I made myself this hearty, healthy, high fiber shake! If you have never heard of an oatmeal shake don’t worry, I hadn’t either, until recently. 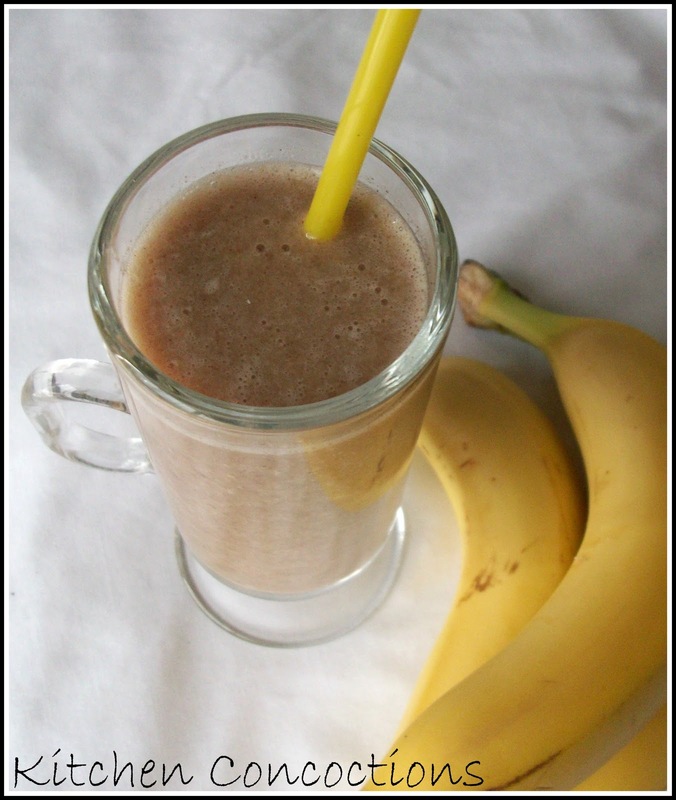 This is a thick shake that fills you up with all the oatmeal and bananas. I felt good drinking it and it left me feeling full satisfied for several hours. The best part is you could make it quickly at night and let it sit in a pitcher in the fridge, so the next morning you have breakfast that you can grab as you head out the door! Notes: When my bananas start to head south (turn black) I put them in a plastic container in the freezer to use for baking. I just used 2 of these bananas for this recipe and because they were so ripe they added a nice natural sweet flavor. 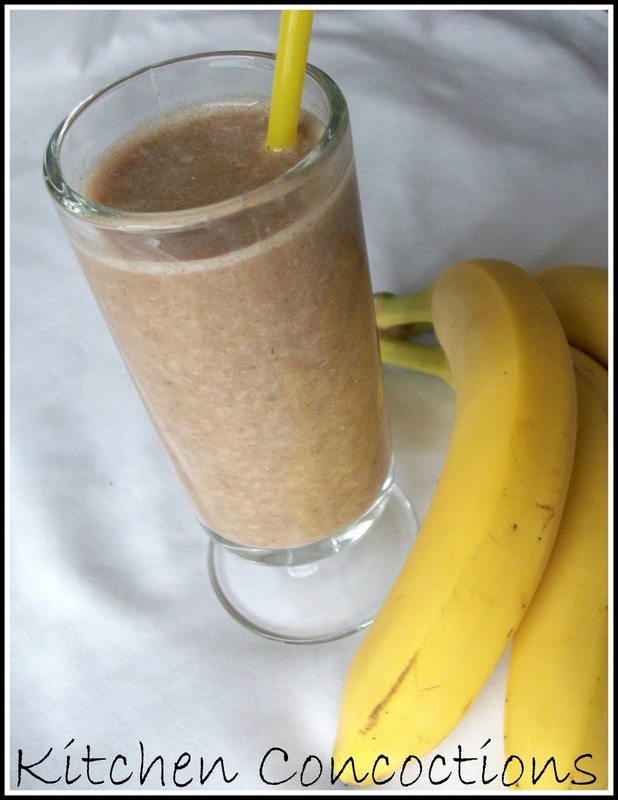 You could also freeze bananas (peeled) when you get home from the grocery store to use for this shake and others. In a small pot, bring water to a boil. Add oats and cook oats in water for 2 to 3 minutes, stirring often until oatmeal becomes thick and bubbly. Remove cooked oatmeal from heat and let it cool a few minutes. « January Is National Oatmeal Month Too! will be back for more!! Me is Jhonny walker from food..though for!